Established in 1978, Armortek is the second oldest armored luxury car manufacturer in the United States. We also supply quality armored vehicles for commercial and law-enforcement use. Since the company's founding, Armortek's reputation for superior security has spread around the world. We've supplied vehicles to customers in Asia, Europe, Mexico, Central and South America, and throughout North America. We armor and protect your vehicle without changing the appearance of the vehicle, as to not draw any unwanted attention. Specialize in Custom Riot Control Vehicles with many options to suit many needs. Quickly mount and dismount riot control devices for stationary or mobile usage. Water cannons and more. One of our most popular specialty vehicles. Protect yourself and other valuable assets in tranposrt. If you can dream it up, we can usually make it. Tell us what you need in your armored vehicle. We have all the cool extras to make your car just like your favorite British secret agent! Special custom equipment to protect the interior of the vehicle from hazardous gases. We can add all the bells and whistles to give you complete peace of mind and defensive capabilities. Body Armor, Bomb Blankets, Bulletproof Briefcases, and more to protect you when you have to get out of the vehicle. We follow standard ballistics protection levels. You select the level you want and ensure the car will protect you at that level. We only use the best materials and we stand behind our work. After 4 Decades in the business we are still going strong. Our focus is still the customer and meeting their needs. This basic philosophy has kept customers coming back year after year. Come be a part of our security / armoring family of customers. Armortek Designed and Manufactured the First Economical Skid mounted Riot Control Truck, SRC. Armortek Designed and Manufactured Vehicle Pressured Clean Filtered air for vehicles, Armoraire. Armortek opened a Manufacturing facility in Brazil. Armortek Joint Ventured with 3 companies in CHINA. Armortek first Armored Personal Protection Vehicle was built. Armortek first Armored Riot Control (ARC) Truck was built. Armortek first Armored Money Transport Truck was designed and built. The owner, Mr. Clint Murphy, turns his passion for personal and vehicle security into a business and Armortek International is created. Armortek was established by REMOUNTING a used Armored Money Transport Body on new truck chassis to extend the life of the Armored vehicle's body. The owner, Mr. Clint Murphy, builds his first armored vehicle. Clint Murphy, the owner and founder of Armortek, has worked in the design and development of security vehicles since 1969. His unwavering commitment to high quality armoring and customer satisfaction earned him the ongoing loyalty of customers and employees alike which continues to this day. Many of our employees have been with Armortek since the beginning of the company. We're a dedicated group personally committed to protecting you and the people you care about, whether it's your own family or valued personnel. A native Texan, Clint learned at an early age the value of hard work and standing by the promises you make. 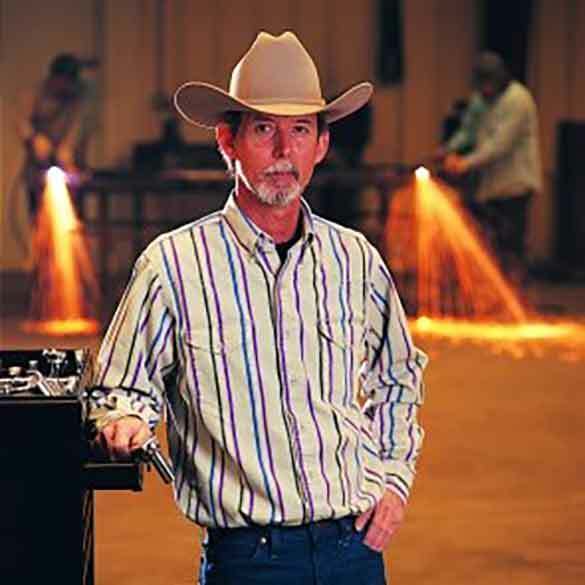 Almost 40 years after founding Armortek International, Clint stays involved in the day-to-day business in spite of the dynamic growth of the company. He makes a point of being available to answer any customer questions, provides hands-on solutions to problems, and personally inspects every vehicle that leaves our facility. As a second generation of the Murphy family prepares for the future of Armortek, those values remain a core part of our company. Let Armortek Design a premium armored vehicle to fit your excact specifications. Long standing relationships with Customers. Personal attention. Read what some of our customers have to say about their experiences with us. Our technicians and engineers have been constructing industry leading personal armored vehicles for over 40 years. We have done and seen it all. Riot Control, ARC, SRC, Water Cannon, Money Transport, Law Enforcement, and other industry specific commercial armored vehicle expertise.